First of all: Happy Christmas!!! 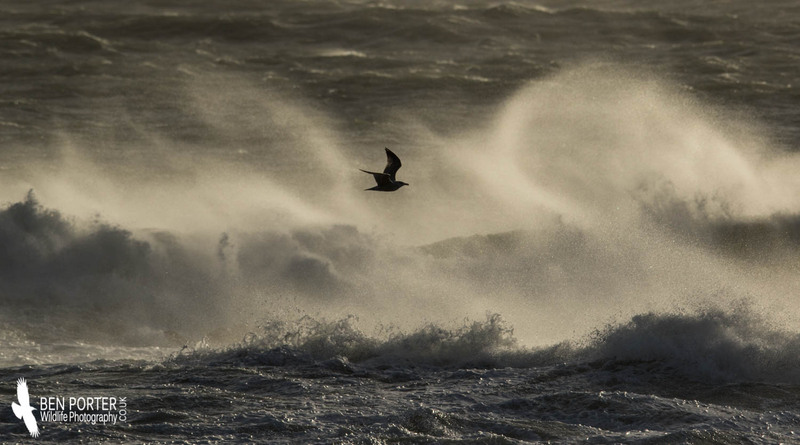 I hope you are having a great day wherever you may be, and are not beset by the same gale-force winds and lashing rain that has been presiding over the island throughout the day! 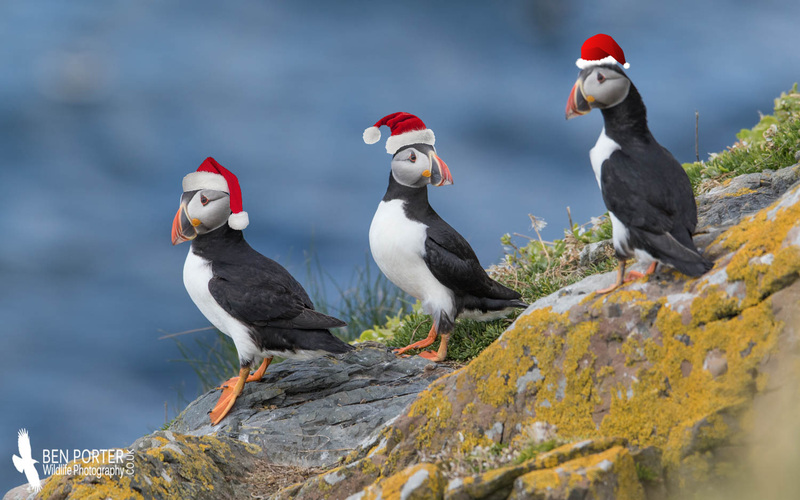 So, for my final post in the photographic advent calendar series, I have decided to focus on Britain's best-loved seabird: the Atlantic Puffin (Fratecula arctica). 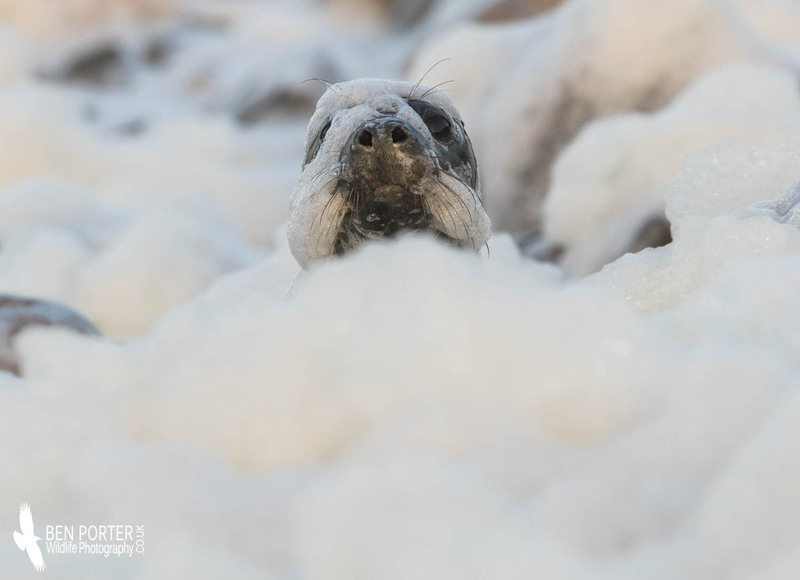 This comical 'clown of the sea' spends most of its life out at sea, and only descends upon our coastal islands for a few months in the spring each year. 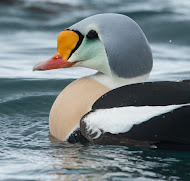 There are three species of Puffin worldwide, including the Horned and Tufted Puffins. 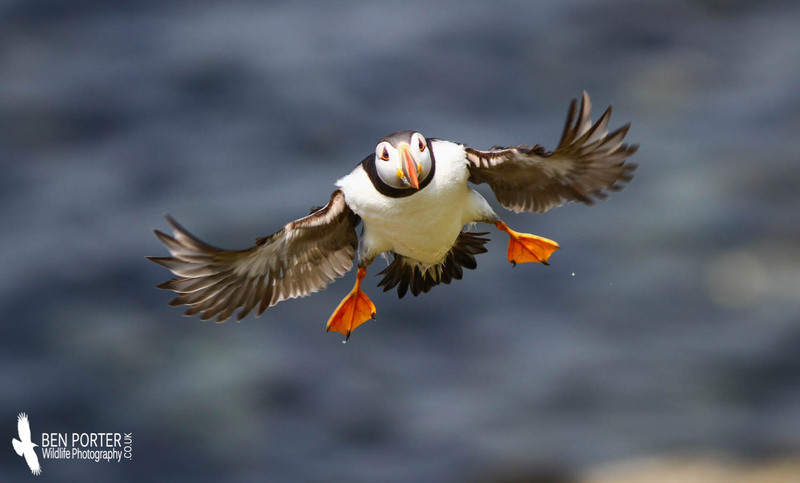 The UK population of 'our' species, the Atlantic Puffin, stands at a little under 600, 000 pairs. 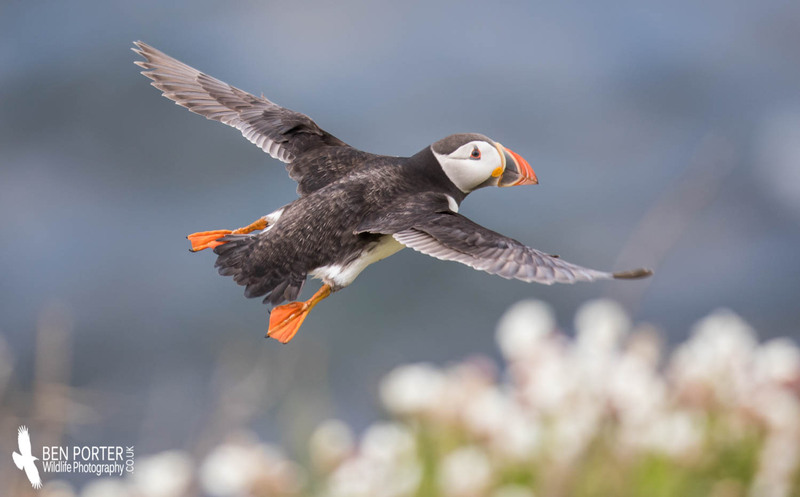 Unfortunately, like so many other species of seabirds in the UK, the Puffin is experiencing population declines in the northern limits of its range, earning it a RED conservation status. 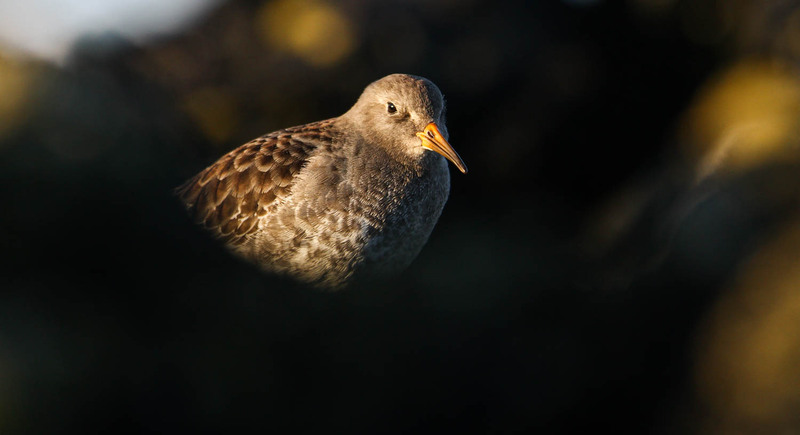 For a long time, it was a bit of a mystery where these smart little Alcids disappeared to during the winter months, but we now know that most populations disperse to feeding areas in the eastern North Atlantic, as far south as the Canary and Azores archipelagos. 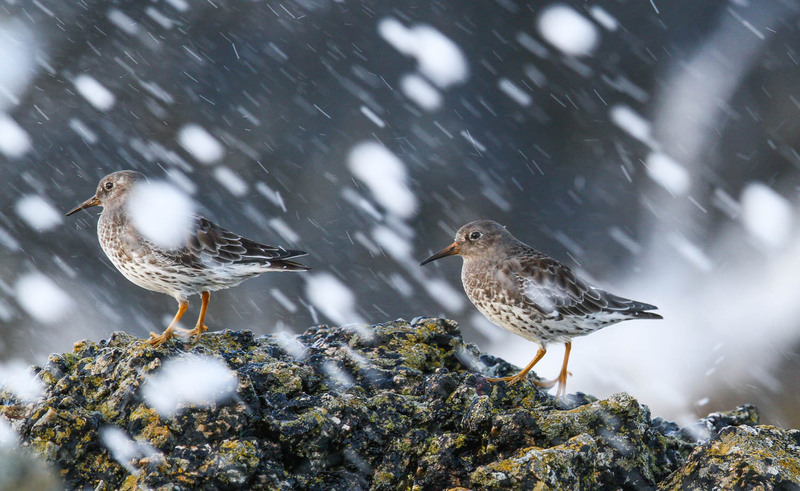 Some birds from the country's northern populations spend most of their time in the North Sea, but adverse weather conditions can make survival hard, forcing them to migrate to the Atlantic. 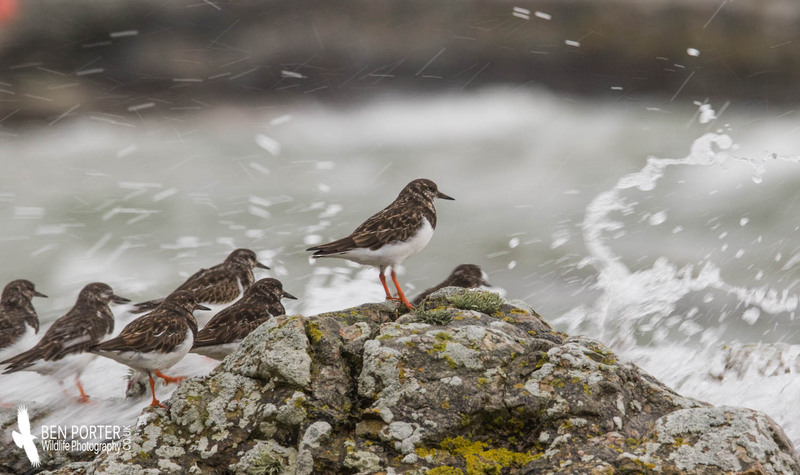 Stormy weather conditions during winter months can have significant impacts on the survival of these birds; a particularly large mortality event recently occurred over the winter 2013/2014 when thousands of birds washed up along British and French coastlines. 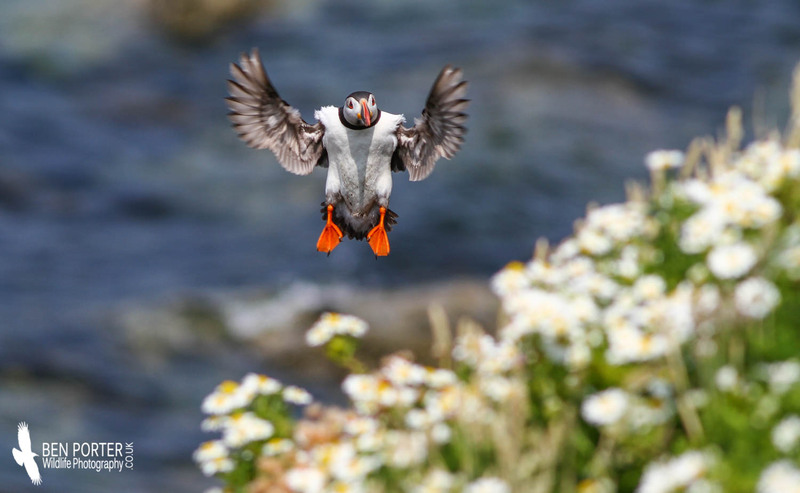 The large, bright, comical bill of the Puffin is one of the main sources of people's love for this endearing species. 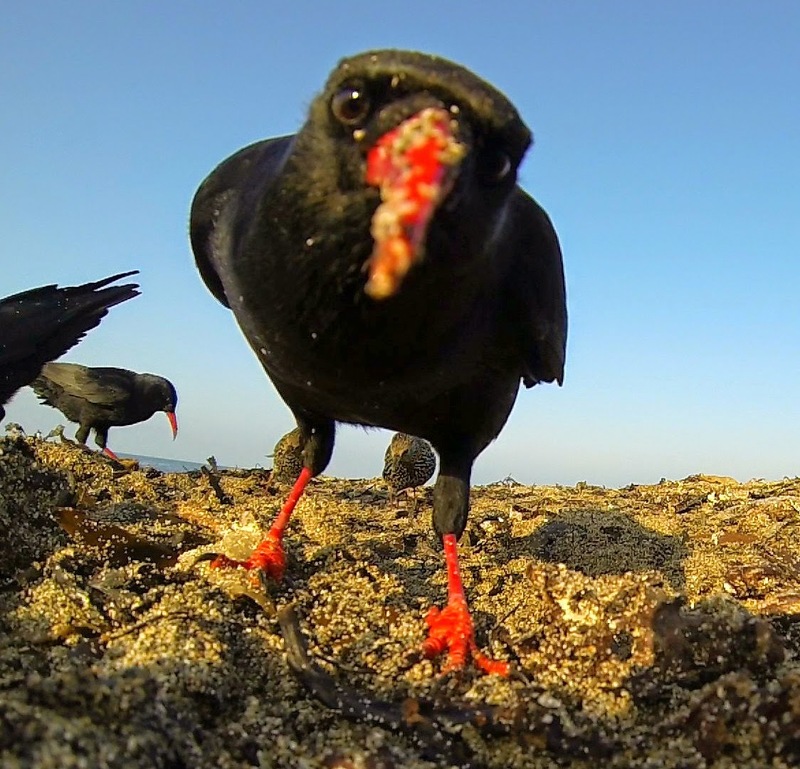 This clown-like feature is really only for show, though: adult birds develop the colourful beak during the breeding season for courtship, which is then moulted and assumes a relatively small size and dark colour for the rest of the year. 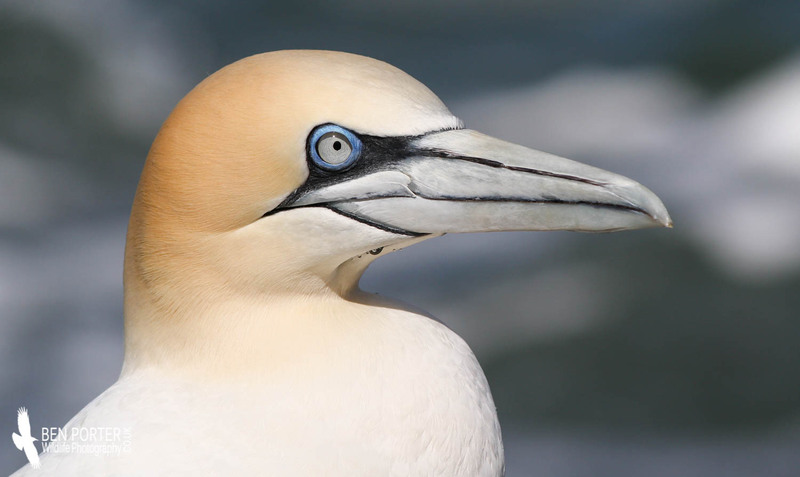 It takes a good five years for their beaks to develop to the mature size and structure of an adult's, growing deeper each year and acquiring several vertical grooves. 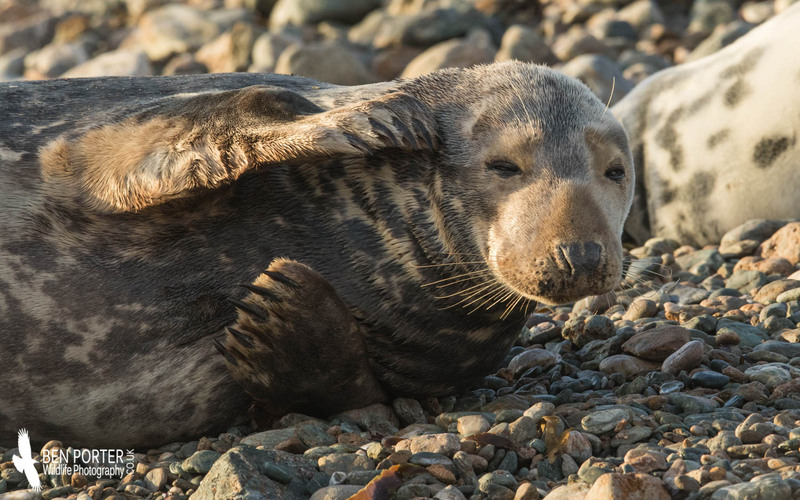 This can be a useful way of ageing this species, as shown in this article. 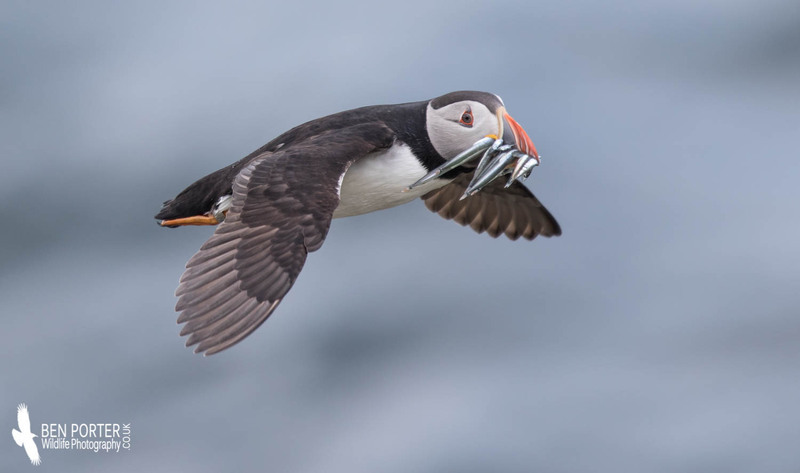 Puffins possess an amazing ability to cram small fish into their bills for feeding their fluffy young. 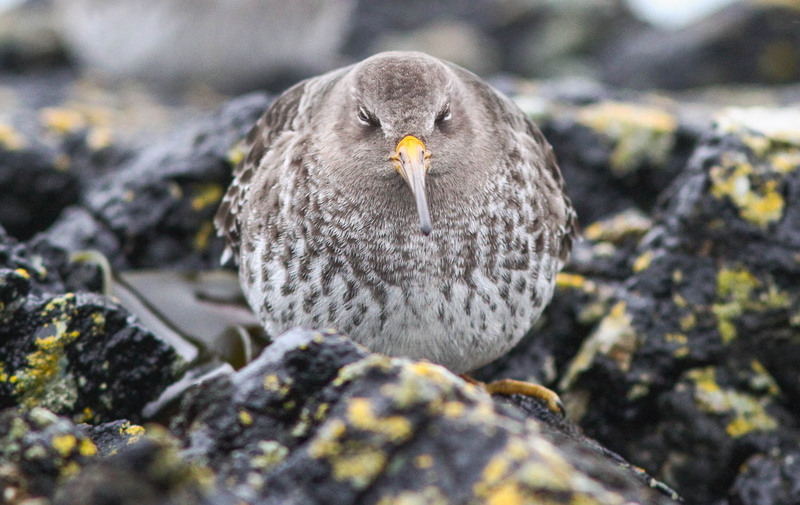 Indeed, they have been recorded with an immense 83 sand eels in one beak! 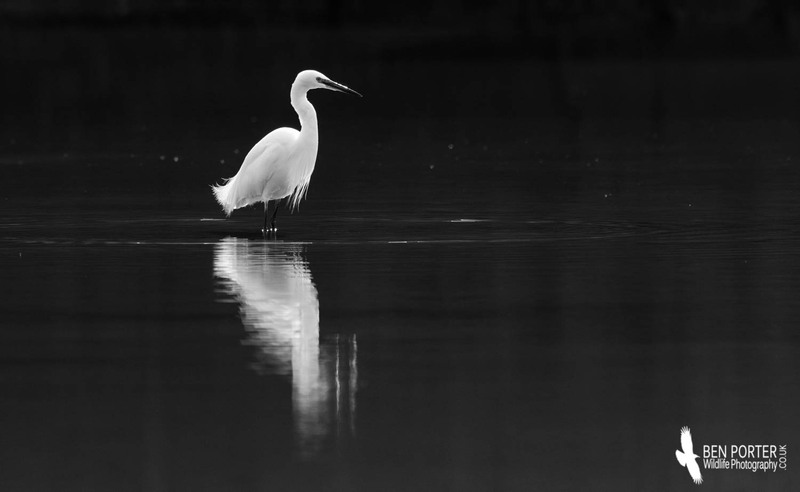 They have several adaptation to enable them to perform this trick: the inner edge of the bill is serrated, like that of a merganser, allowing slippery fish to be gripped firmly. 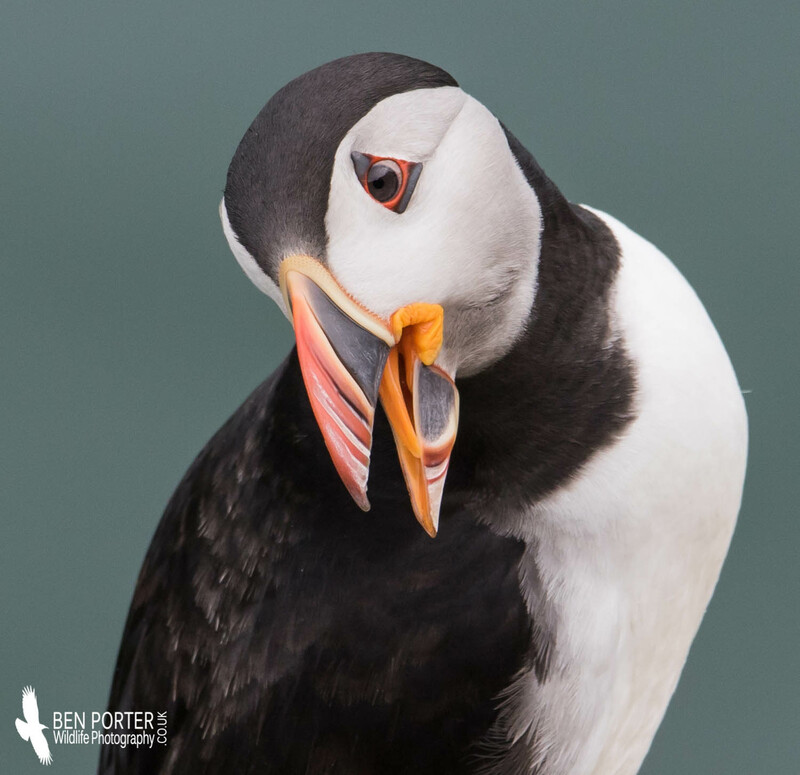 Secondly, an extra bone in the Puffin's jaw prevents fish from falling out from the tip. 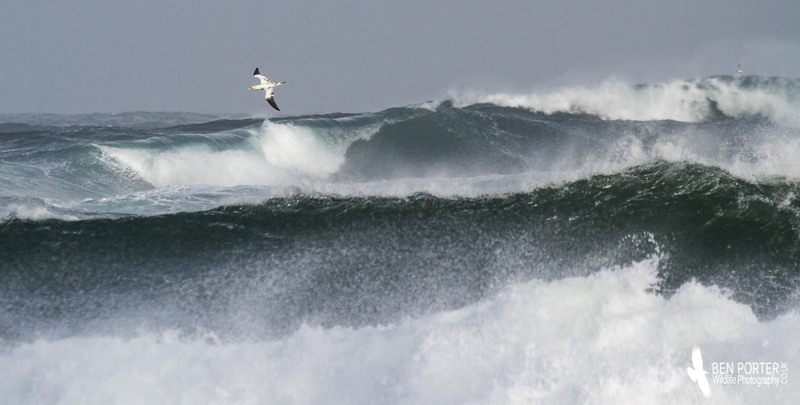 And thirdly, their jaws have a flexible hinge at the base which further facilitates this impressive ability. So there we are, I hope you enjoyed the series! Happy Christmas! The three wise men? 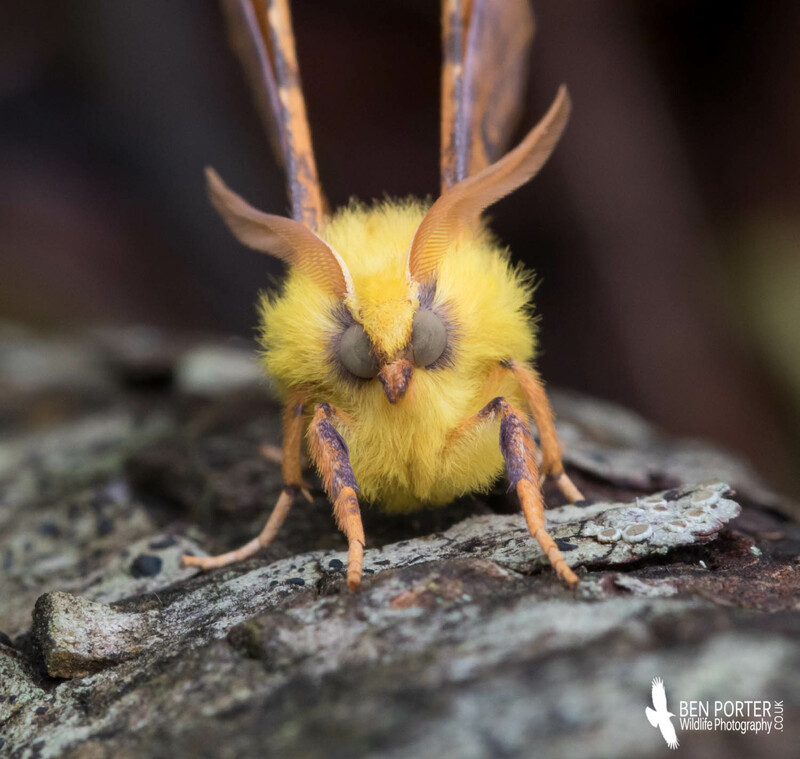 To try and keep at least remotely seasonal with my choice of species to describe for Christmas Eve's advent blog, I have decided to focus on a species which does bear an angel-like appearance at times... (okay, so it is a bit of a tenuous link! 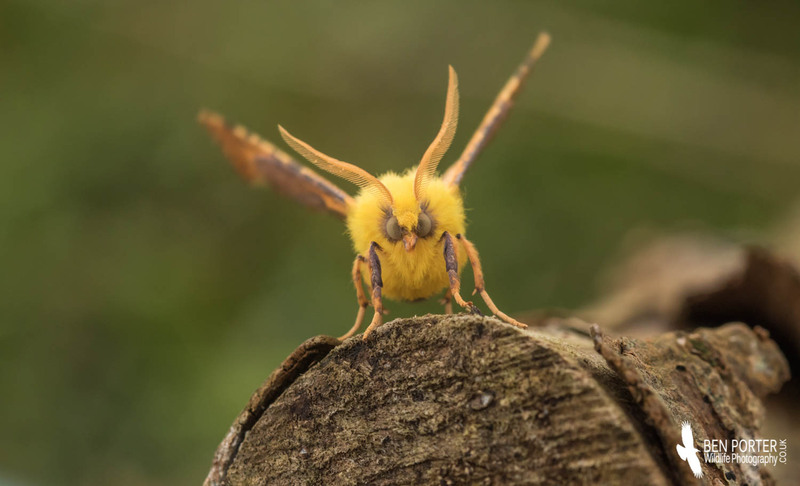 )...the Canary-shouldered Thorn (Ennomos aliniaria) is a moth which really epitomises the autumn for me. Although they emerge from pupation as early as July, you generally come across these striking geometrid moths towards the end of August and through September. 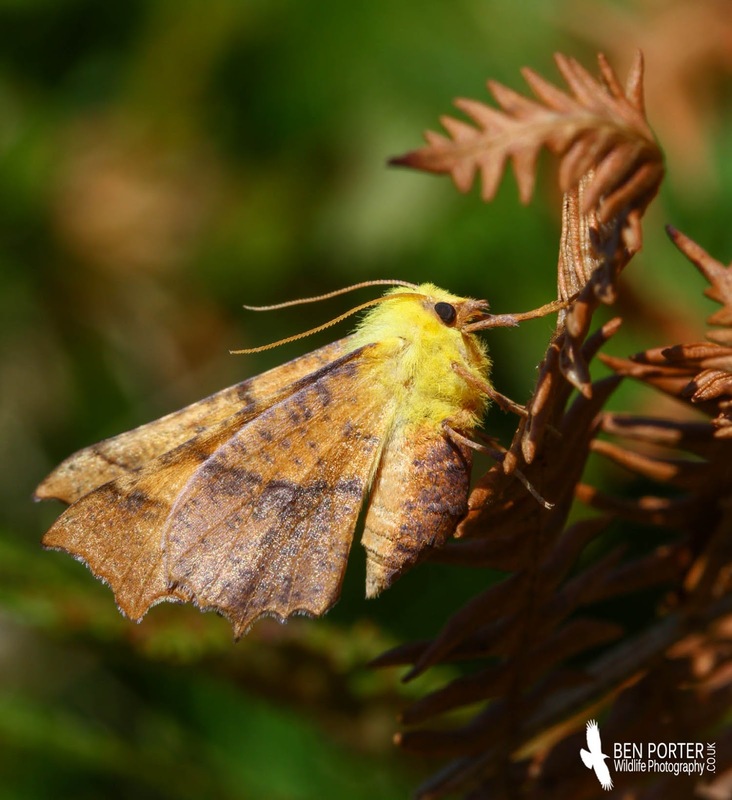 With their bright yellow thorax, orange and purplish-toned wings and abdomen, they are truly stunning moths. 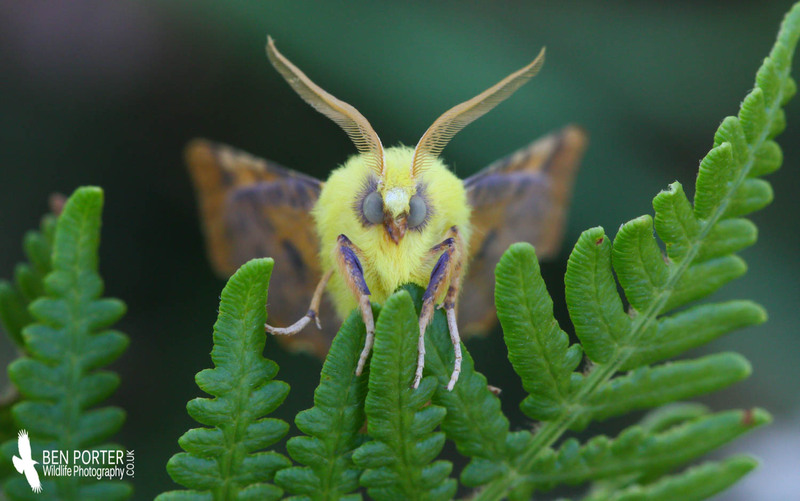 The male specimens attracted to light traps also bear an extra feature: feathered antenna. 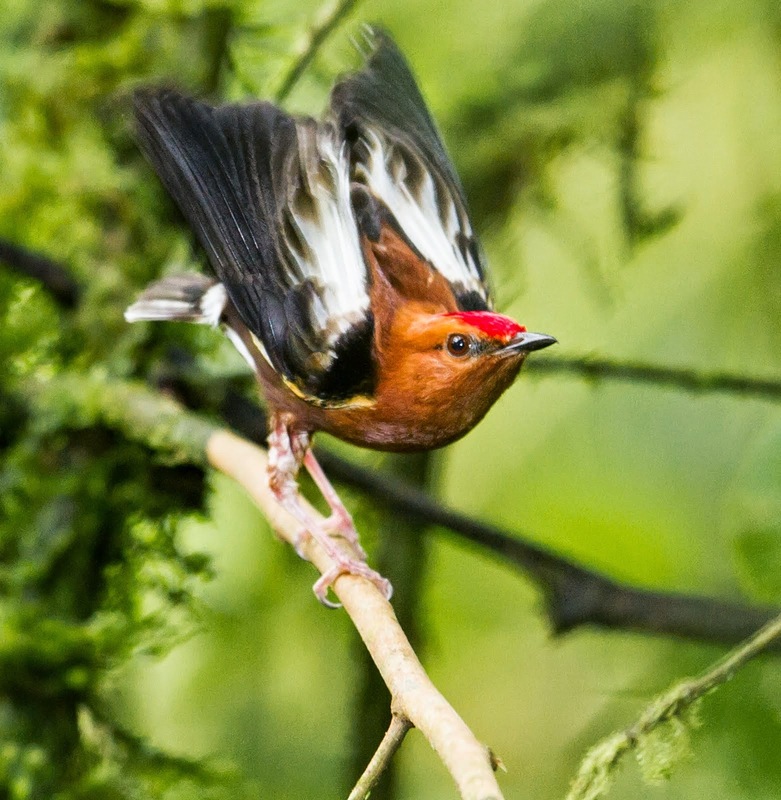 These delicate bipectinate antenna help the male locate females through the detection of phermones using rows of sensilla (the feathered structures). 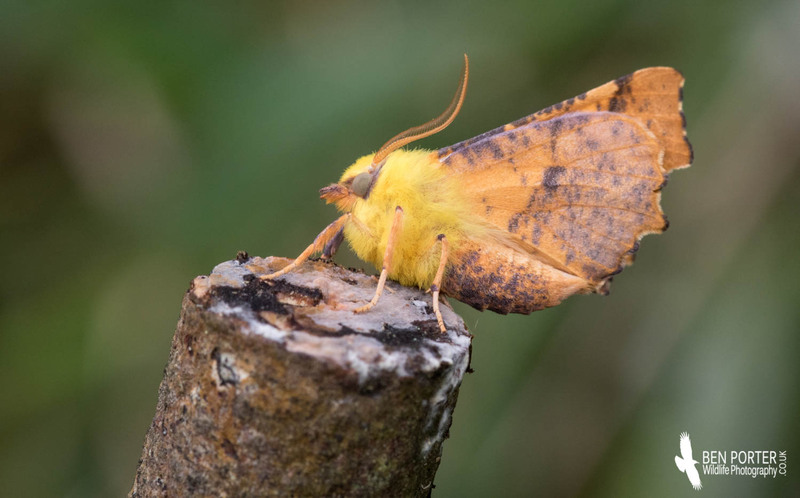 Common throughout the UK, the larvae feed on a range of herbaceous plants including goat willow (which is probably the primary food source here on Bardsey). 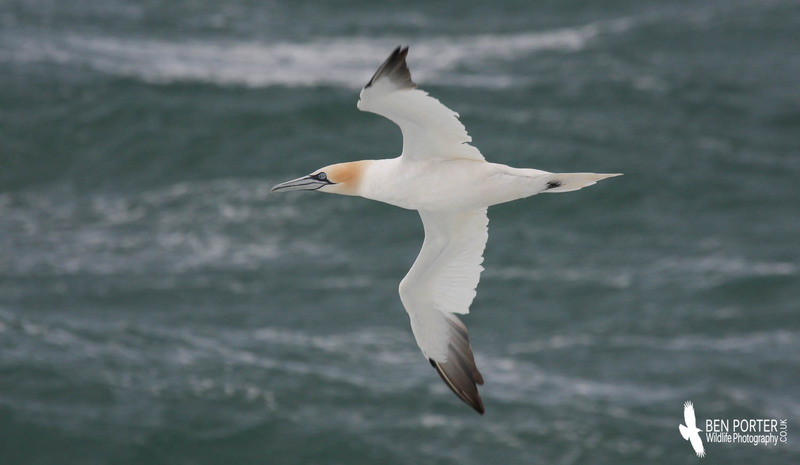 The Gannet (Morus bassanus) is the northern hemisphere's answer for an Albatross, and with a wing span of almost 6 feet, they aren't far off the size of some of the smaller Diomedeids. 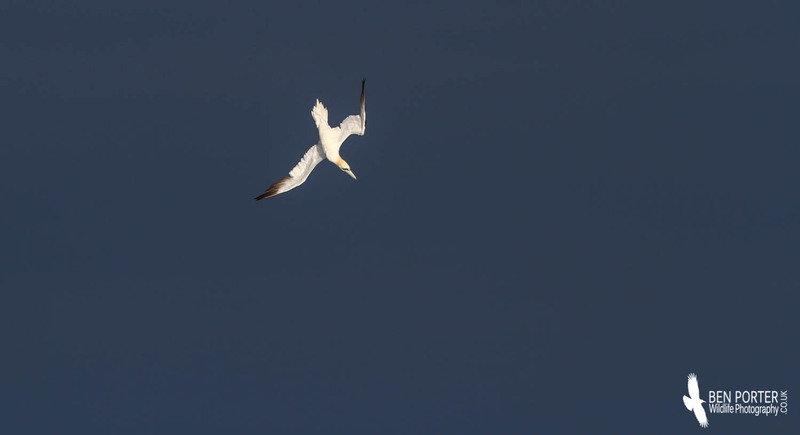 Gliding and skimming over waves, or plunging into the sea from great heights like a black-and-white dart, the Gannet has to be our most familiar seabird after the Puffin. 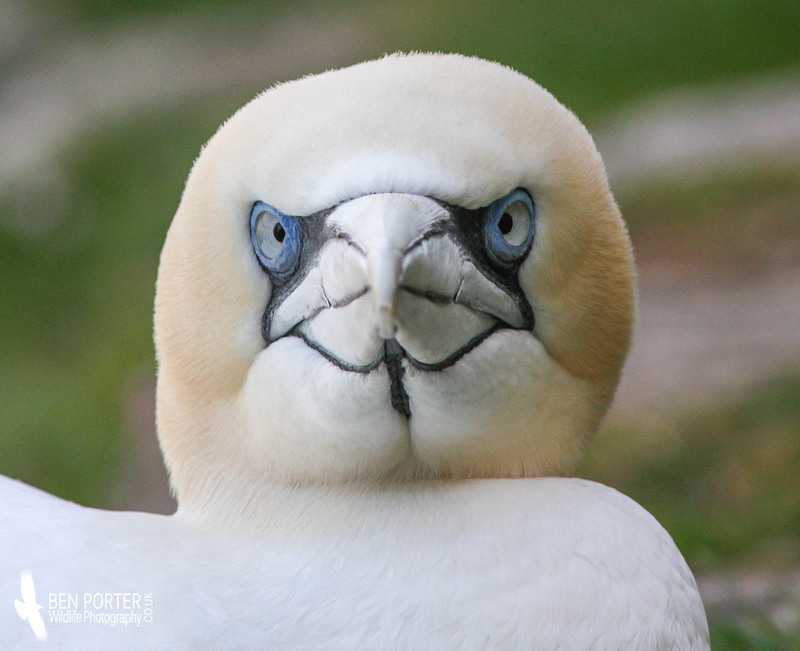 And they are almost quintessentially British: 60-70% of the World's population of Northern Gannets breed around the UK, mostly on Scottish offshore islands. There are, however, a couple of colonies on the other side of the Atlantic in Quebec and Newfoundland (Canada). 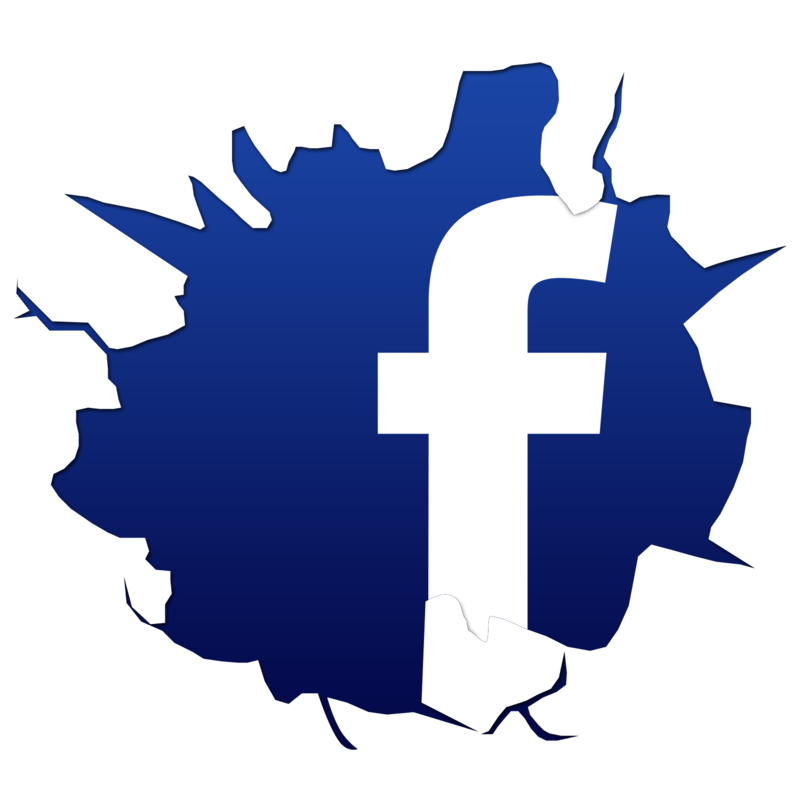 The British population stands at around 300, 000 pairs, with individuals living as old as 37 years. 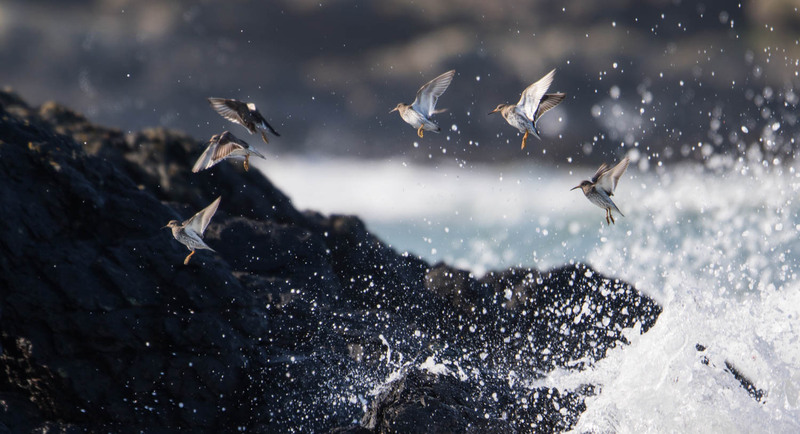 Perhaps their most famous ability is that of their amazing feeding technique: this involves a vertical dive (from as high as 50 metres) into the sea, accelerating to speeds of 100 mph before penetrating the water's surface and darting after their choice prey, which takes the form of pelagic shoal species like Mackerel and Anchovies. 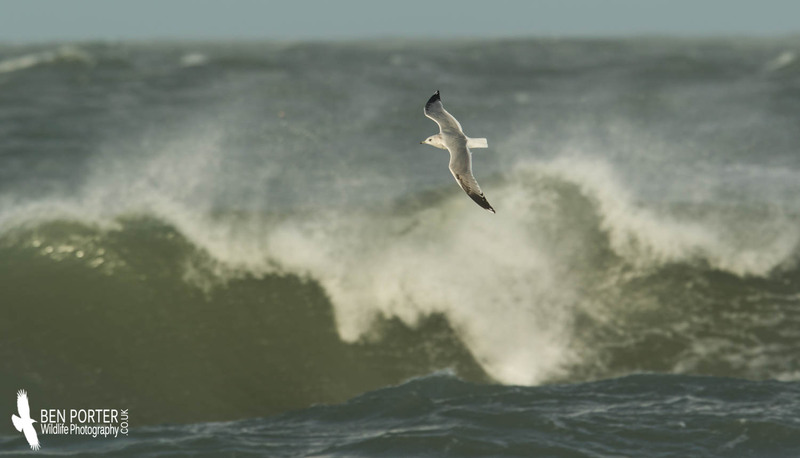 To enable them to perform this impressive aerobatic skill, they have a number of adaptions: several subcutaneous air sacs are present in various locations around their body, which act as cushioners during the dive; their sternum is very strong, providing internal organs with protection from the forces of impact; their lungs are also well developed, which is thought to further aid support under high pressure; and their wings are able to fold flush against the body to permit an incredibly streamlined shape. Curiously, this smart bird used to go by the name of 'Spectacled Goose' (or Solan Goose), which referred to the bluish eyering that adult birds posses (see images below). To tell the different sexes apart, one has to get a decent look at their feet- yes, their feet! 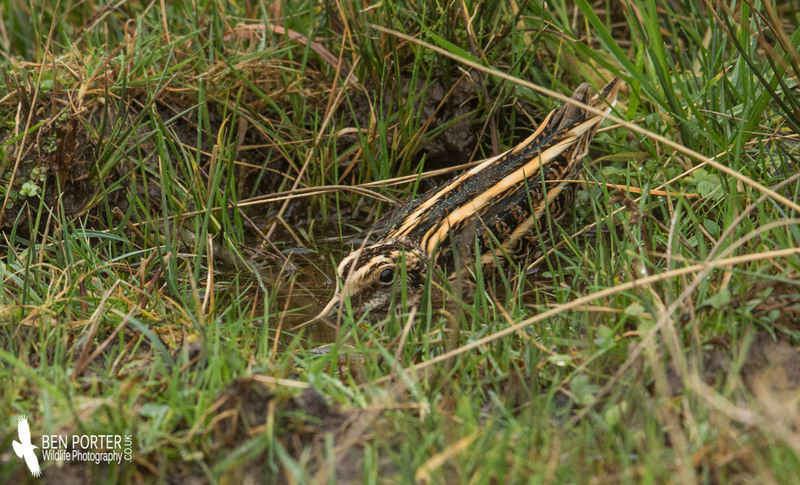 In males the lines running along the webbed surface of their toes is yellowish, compared to a more green colour in females. 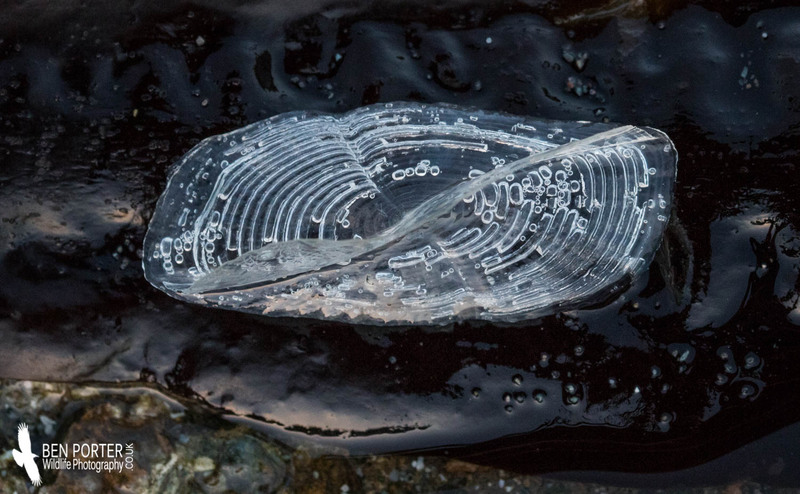 Today I am going to focus on a curious little organism which has a fascinating story to be told: the By-the-wind Sailor (or Velella velella, from velum: a sail). 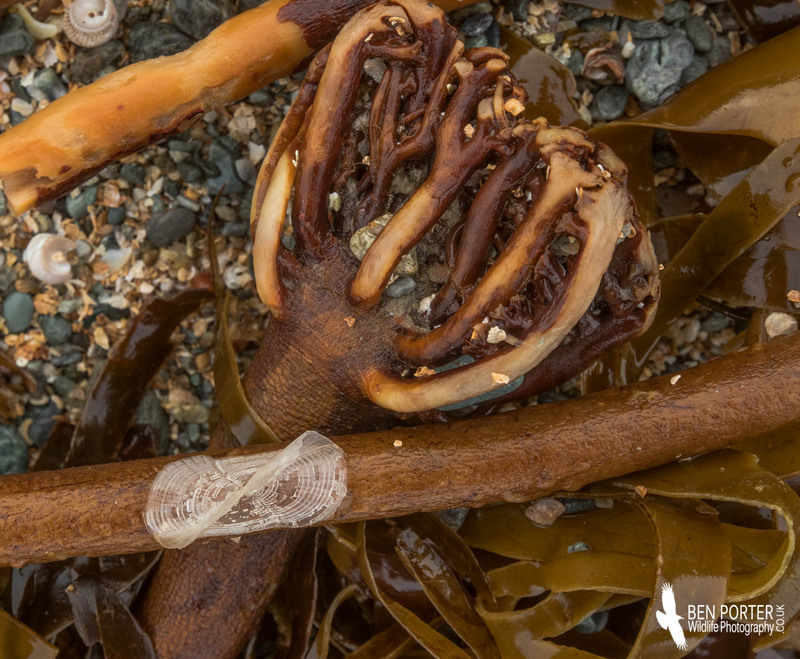 Large wrecks of these disc-shaped creatures have been appearing around much of the UK's western coastline in the last month or so, and we have also been seeing plenty washed up along Bardsey’s shoreline. 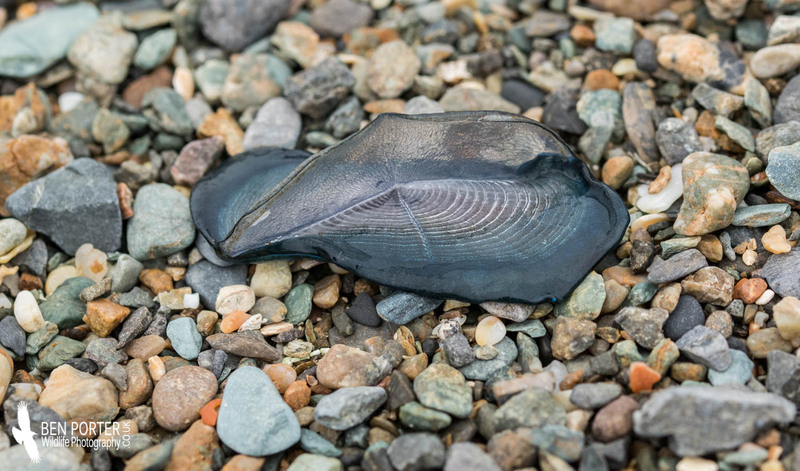 Living in temperate and warm waters, Velella velella is found in all of the World’s oceans, often occurring in wrecks during inclement weather conditions in the autumn and early spring. These wrecks can involve tens of thousands of individuals, such as occurred in 1992 and 2004. 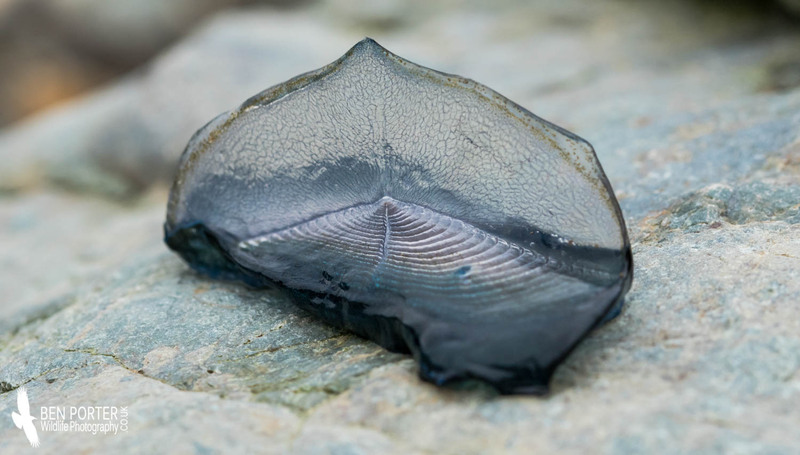 Velella velella leads a fascinating life: like nearly all Cnidarians, this species has a two-part life cycle, composed of a medusa (or jellyfish) stage, followed by its more familiar polyp stage. The medusa stage takes the form of a tiny 1mm jellyfish, which is released from the polyps via an asexual budding process. 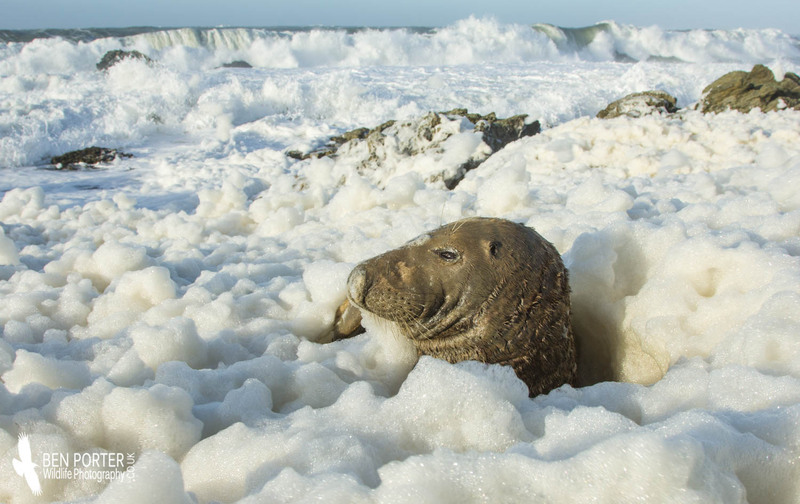 The second stage of its life cycle involves many individual polyps joining forces to create a colony that forms the curious spinning top-shaped organism that 'sails' the oceans. The tiny individual animals (the polyps) are specalised to perform specific tasks, just like bees in a hive colony! Some polyps form the gas-filled disc that is hardened with chitinous material, enabling the whole colony to stay afloat and range over vast tracts of ocean; others are involved with prey capture, forming the tentacles that dangle from the underside and possess nematocysts for paralyzing small planktonic organisms; others still are involved with reproduction and the digestive system. The sail that stands erect atop the disc of polyps can either run in a north-east to south-west direction, or a north-west to south-east direction. 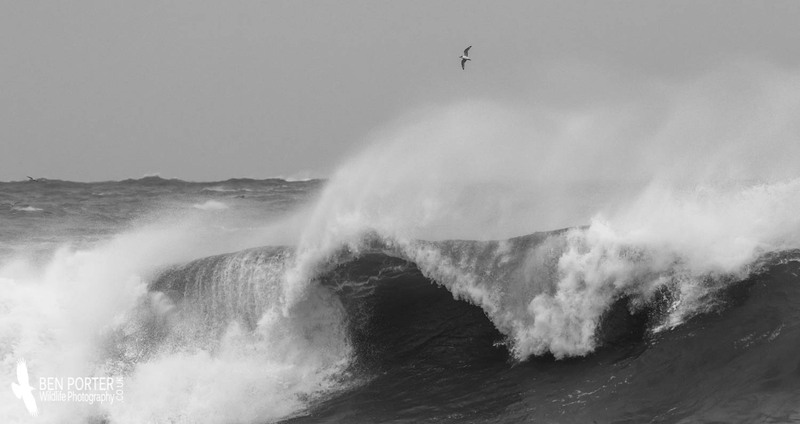 The orientation of the sails affects whether the sailor will drift left or right of the wind direction, ultimately deciding where it will travel. 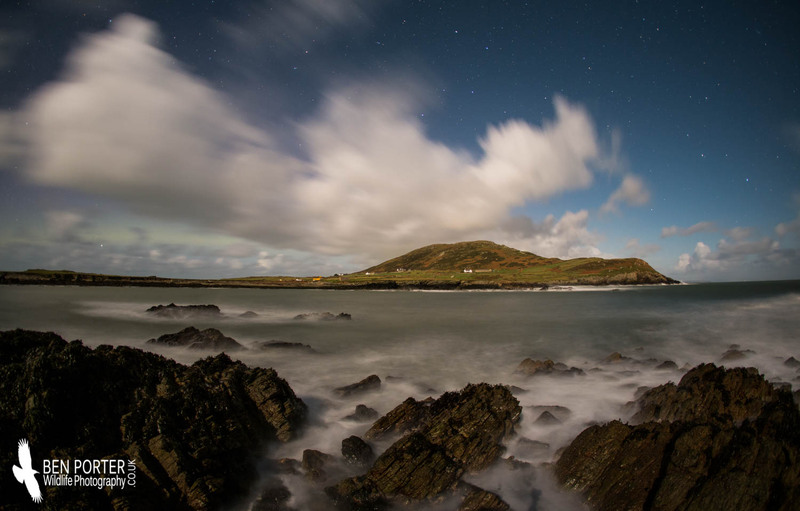 The blue colour of the outer disc comes from astaxanthin proteins in the mantle tissues, although in many of the individuals encountered around Bardsey these proteins seem to be absent. 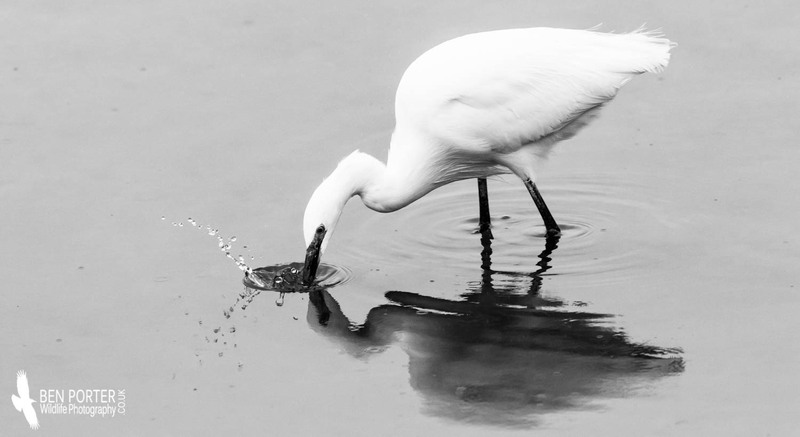 The Little Egret (Egretta garzetta) has a remarkable colonisation story in the UK, which has occurred rather rapidly over the last two decades. 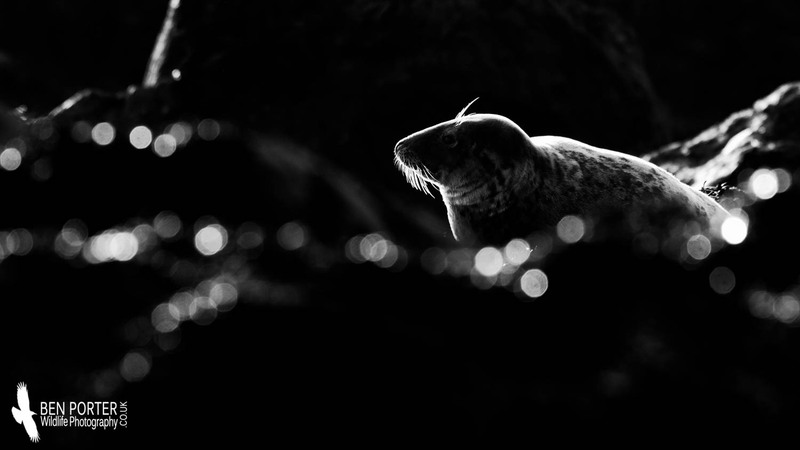 Although common throughout Europe and the Mediterranean, a range expansion into western and northern France in the latter half of the 20th century preceded its establishment as a breeding species in the UK in the late 1990s. 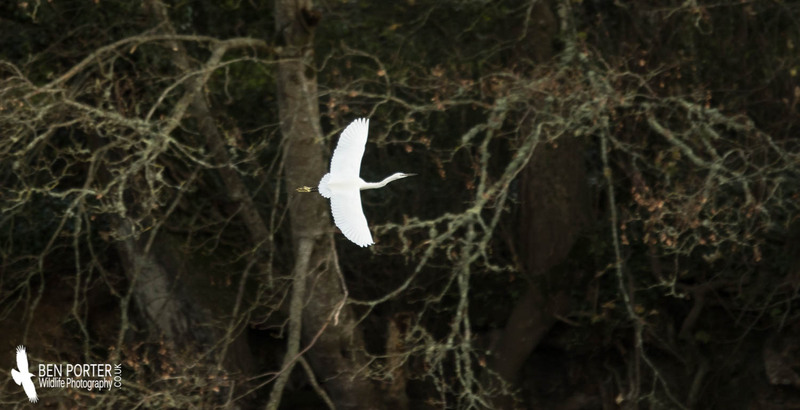 Prior to this arrival, it was a very rare sight indeed around the southern coast of this country, attracting about as much attention as a Squacco Heron does at present. 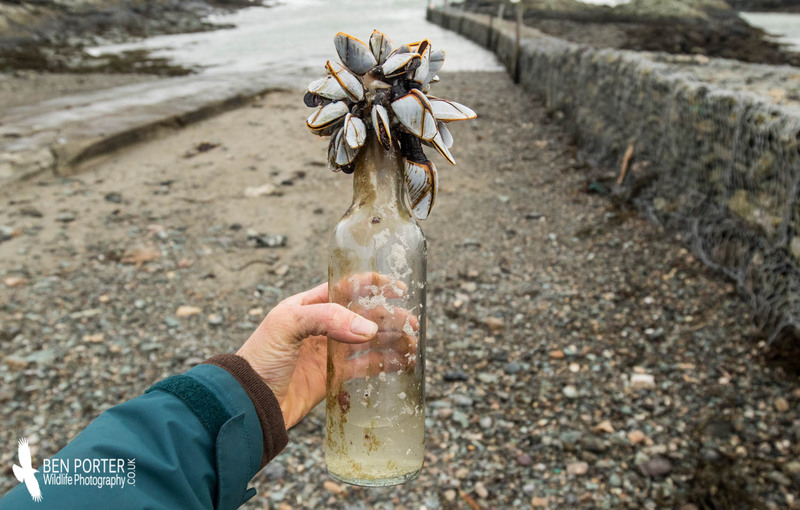 However, this range expansion (voiced to be a climate change-driven movement) led to its population explosion in the UK: the first successful breeding attempt was in Poole Harbour (Dorset) in 1996; ten years later there were 500 pairs in 60 colonies, followed by 800 pairs just two years later! You can see an impressive graph by the BTO documenting this colonisation here. 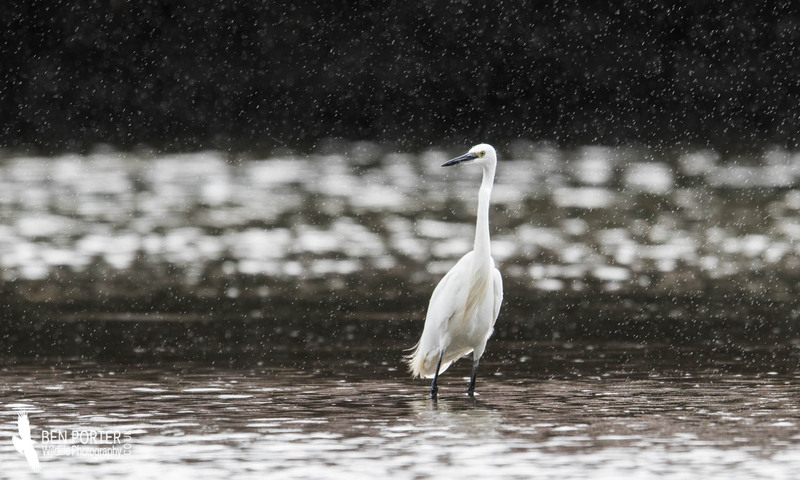 This species hasn't always had it easy: the elegant neck plumes sported by birds in breeding plumage were once sought out for ornamental decorations and fashion purposes, leading to significant population declines in the 19th Century. Indeed, the price for these plumes reached £15 for 28 grams, which is about £875 in today's prices! That made these plumes more valuable than gold for a time! Thankfully though, laws (and tastes in fashion) have since come in to put a halt to this pointless slaughter of such a beautiful bird. 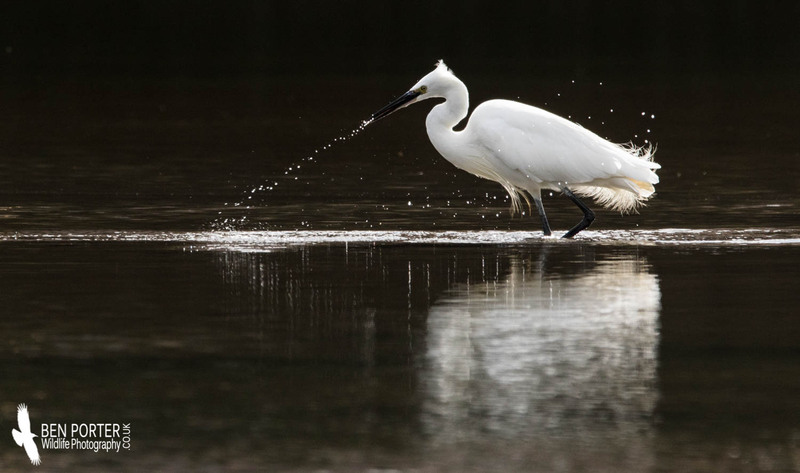 Nowadays, this elegant species can be found stalking the shallows in estuaries and coastlines around much of the UK, stabbing into rock pools and mud flats with its distinctive poised gait after invertebrates such as fish and crustaceans. 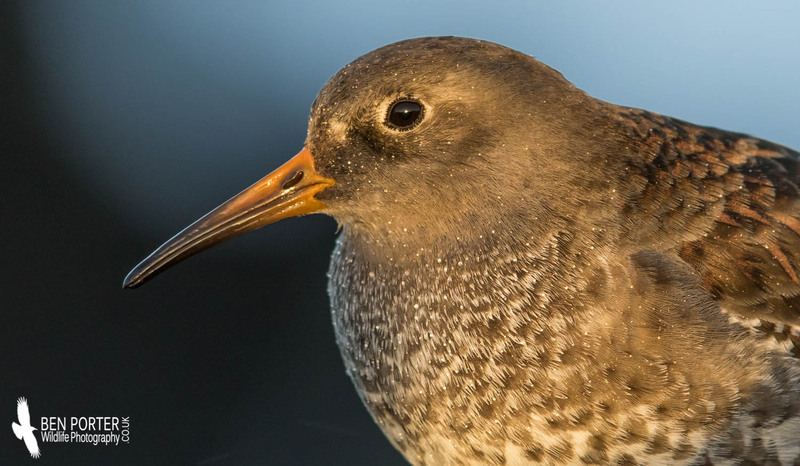 For today's advent calendar blog post, I am focussing on a species which is perhaps a little more suiting to the current time of year...the Purple Sandpiper (Calidris maritima). 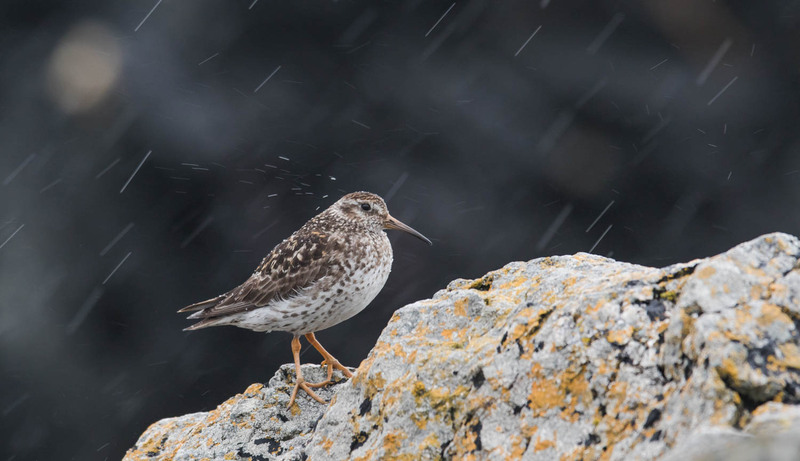 This smart little wader is a favourite of mine, with a subtle plumage of gey tones with a delicate purplish tinge in the winter, accompanied with the bright yellow legs and base of the bill. 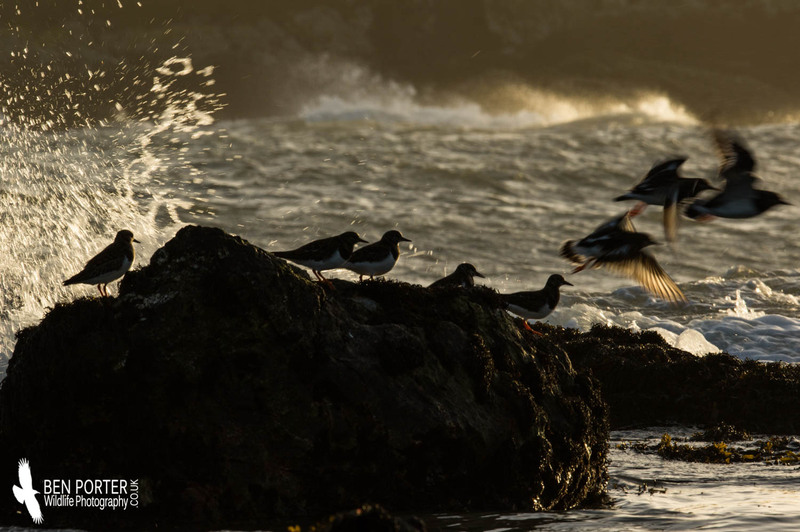 They can be tricky to spot, remaining very well hidden at high tide in its preferred habitat type: dark rocks and boulders in the splash zone around exposed coasts and shorelines. 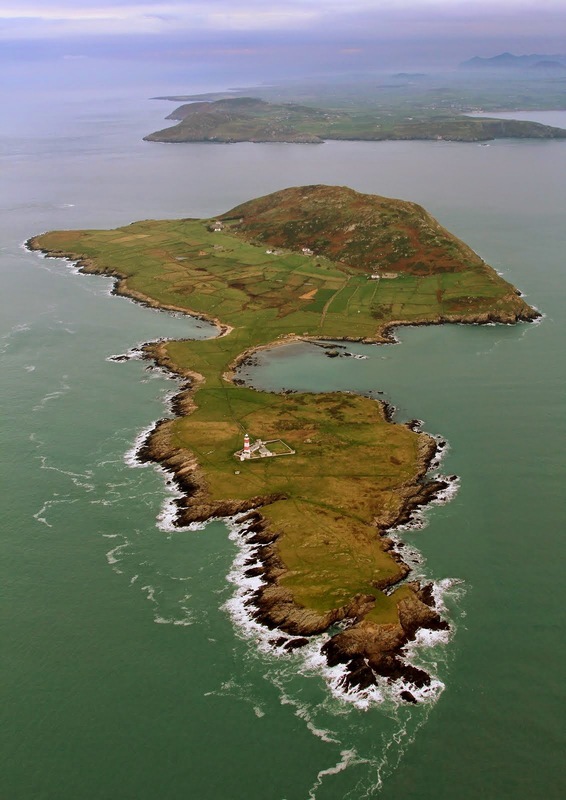 Here on Bardsey, we have a small flock of wintering birds every year, although it has gradually been declining from around 50 birds in the 2000s to just 10-15 this winter. 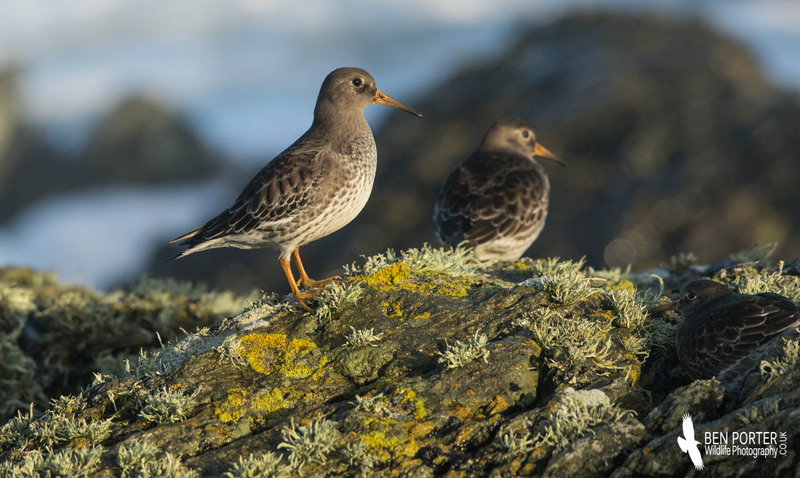 This trend fits with its status as an Amber species of conservation concern in the UK, due to recent declines in wintering and breeding population declines. 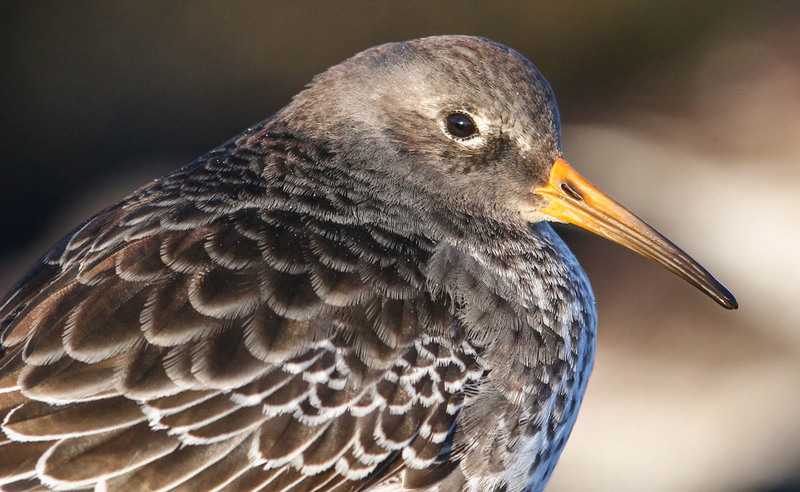 The Purple Sandpiper assumes a very interesting mating system in its breeding areas in the Arctic tundra: when paired, the Purple Sandpipers display a long-term bond with their partner, in a relationship known as monogamy. 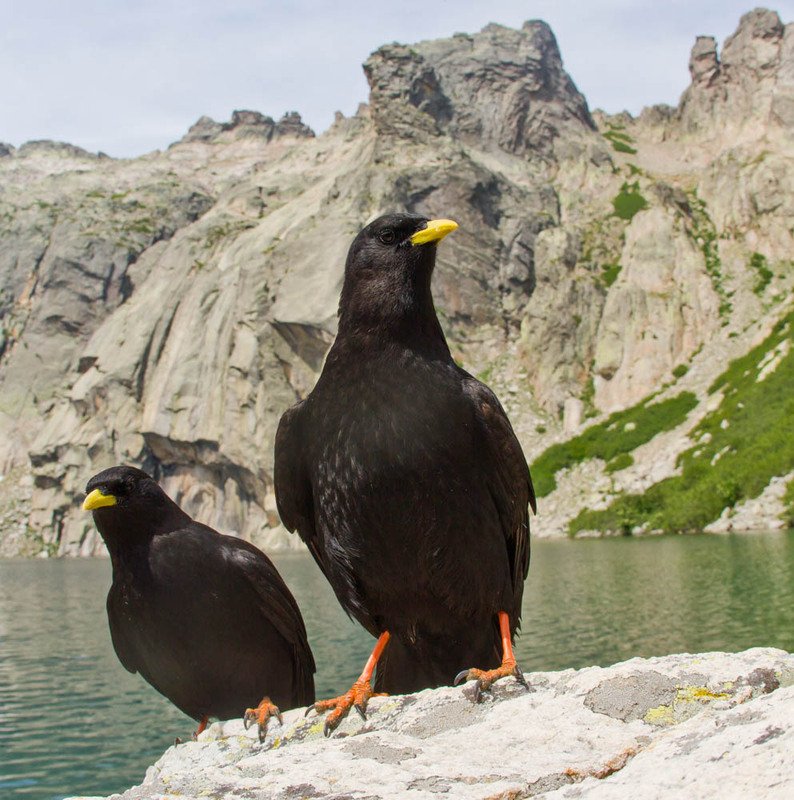 However, characters more typical of a polyandrous mating system have also been noted: it seems that the male takes on almost all the responsibility for the parental care of the hatchlings, with very little help from the female. 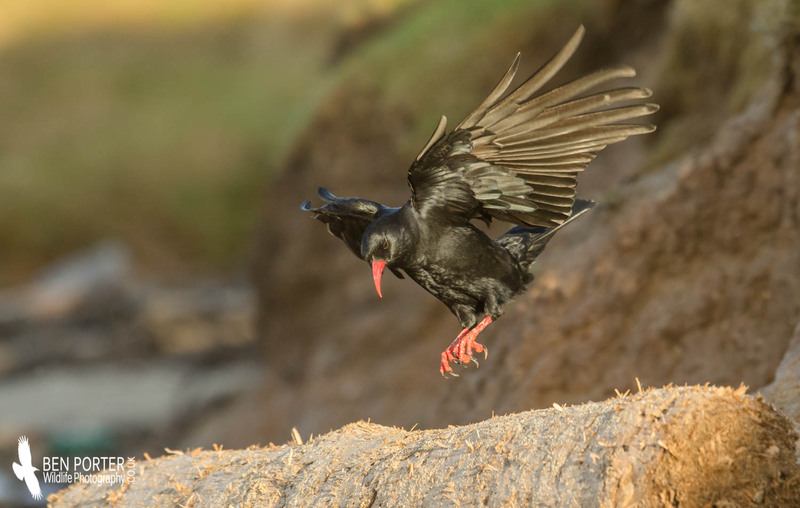 They display the typical 'broken wing' tactic when threatened by predators, to lure attention away from a nest or young. 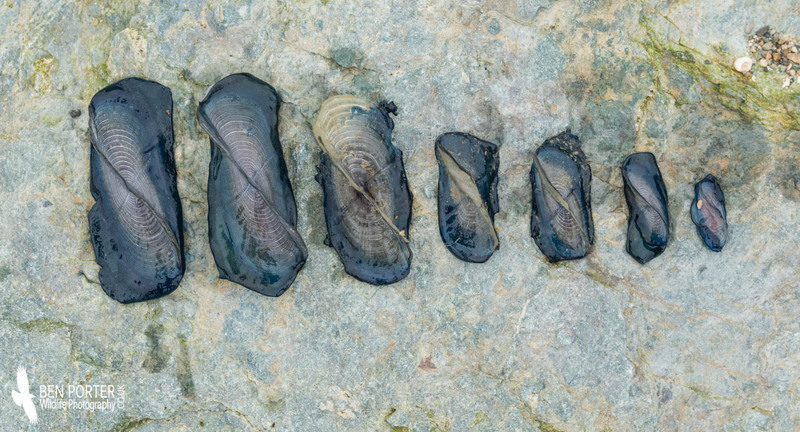 The food source for this species varies depending on the time of year: in the summer, a range of terrestrial invertebrates such as spiders and insects will be taken, with more of a reliance upon marine gastropods and crustaceans in the winter months.